San Francisco’s combined sewer system includes 1,000 miles of pipeline which collects residential and business sewage along with storm water runoff. 27 pump stations transport wastewater to the City’s 3 treatment facilities, and 8 deep-water outfalls discharge the treated water into San Francisco Bay and the Pacific Ocean. This 20-year, multi-billion dollar program will significantly improve San Francisco’s 100-year-old sewer infrastructure. The approximately 70 projects will provide upgrades to reliability and performance, while also making the system seismically safe. ECS staff provides the SFPUC Project Managers with accurate, timely project controls information required to track, forecast, and manage their projects. ECS provides detailed cost and schedule information throughout the project from the planning, design, environmental phases, through bid & award and construction, and final closeout of the project. This information includes monthly and quarterly accurate assessments of current status, trends, and forecasts, as well as reporting of varying levels of the Work Breakdown Structure on an as-needed basis. This detailed information enables the SFPUC Project Managers to effectively evaluate and manage these major projects and programs. San Francisco’s sewer system is 100 years old, and several components, including this tunnel 10 feet below Tiffany Avenue just south of the Mission District, were constructed in the 1800s. Components of the infrastructure are failing and need of significant repair, threatening public health. Following several years of input and feedback from residents and business along with research of other long-term sewer capital projects, the SFPUC is now moving forward with the Sewer System Improvement Program (SSIP) to upgrade, replace, and seismically retrofit the system, enhancing reliability and performance. 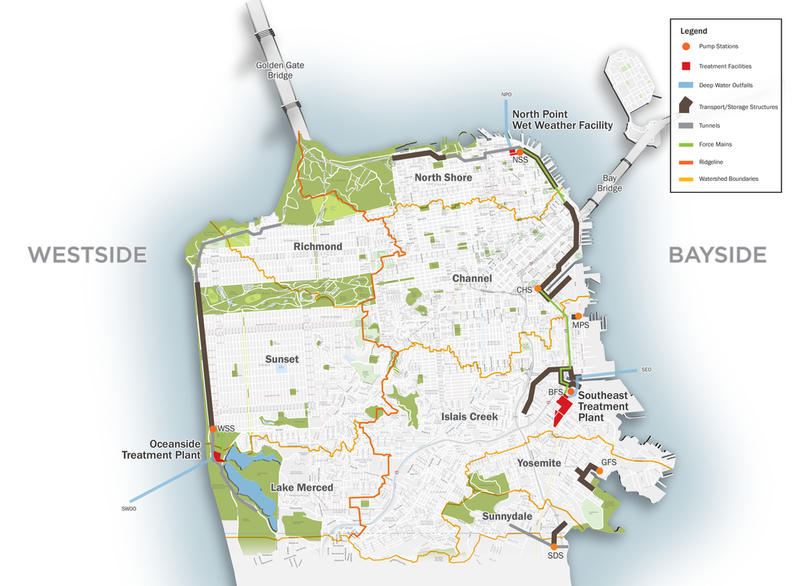 San Francisco is the only major coastal California city that has a city-wide combined system for collection and treatment of both sewage and storm water runoff. When heavy rains occur, water builds up and often overwhelms the current aging system, spilling excess onto the beach. This is one of several needs to be addressed in the SSIP projects. This is San Francisco’s Southeast Treatment Facility, one of three such plants citywide. The City treats 80 million gallons of wastewater on dry days and 575 million gallons on rainy days. All-in-all, the sewer system treats 40 billion gallons of wastewater each year.